Our family-owned parent company, Federal Process Corporation, has a highly successful track record of growing niche industrial businesses. Originally a manufacturer of pipe thread sealants, Federal Process has leveraged its extensive chemical expertise and market knowledge to establish highly differentiated products under trusted brands like ThredTaper. The company manufactured its first can of Gasoila® Pipe Thread Sealant in 1915. Small batches were made to meet high quality standards set by the company’s founders. The company continues to manufacture chemicals in small batches in order to closely monitor the quality and reliability our customers have come to expect from Federal Process Corporation. Proud of the reputation of the line of Gasoila® chemicals – the product of choice in petroleum, plumbing, LP Gas, HVAC, automotive and general industrial markets – the company began manufacturing the Thred Taper as a way to automatically apply the high quality PTFE thred sealant tape to threaded fittings and connections. 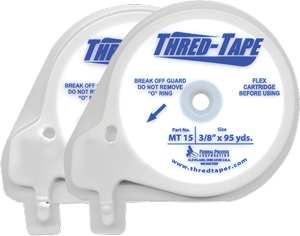 Since the development of the ThredTaper in the 1960s, our company has evolved to offer several customizations to the Thred Taper machine including a multi-wrap functionality and the ability to wrap unique and special parts. Easy-to-work with technicians and product managers who are ready to solve your unique taping needs. They are readily available for remote, and sometimes, onsite troubleshooting to ensure proper operation of your taping machine.